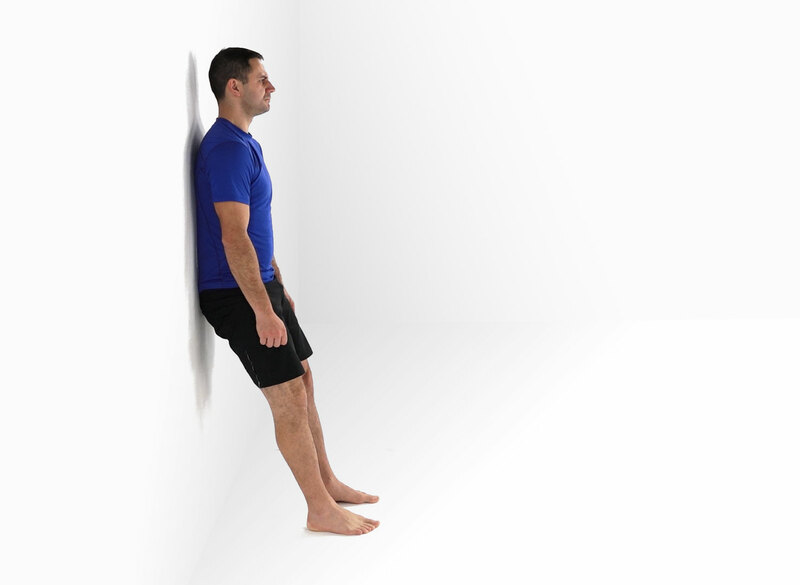 • Stand up against a wall with your your feet in front of you (distance feet/wall: when your thighs are parallel to the ground your knees should be at 90°). • Slide up and down the wall and keep the upperbody in contact with the wall. • Go down to parallel with your thighs. • Keep the knees in line with the feet. 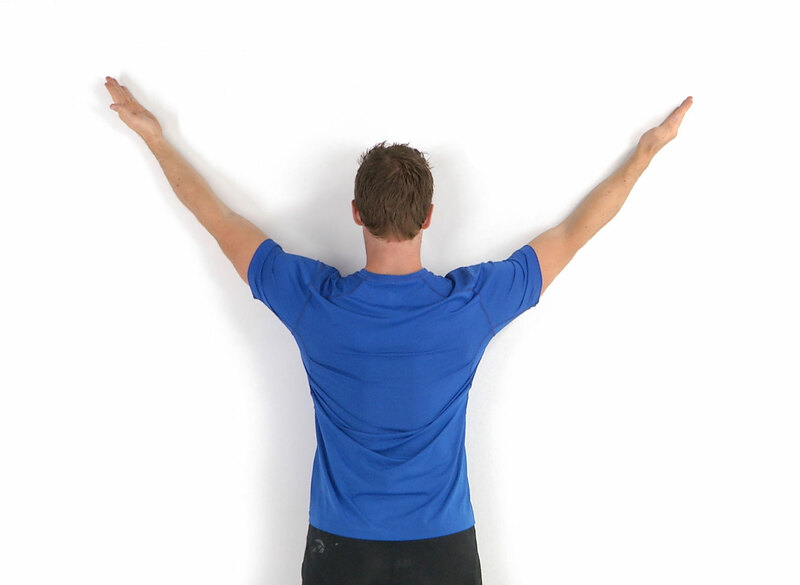 • Stand facing a wall with your arms straight and hands on the wall. Flex your elbows a little bit so they are slightly bent and lift one hand 3-4 inches off the wall, maintaining the position of the shoulder blade and hold for 3 seconds. 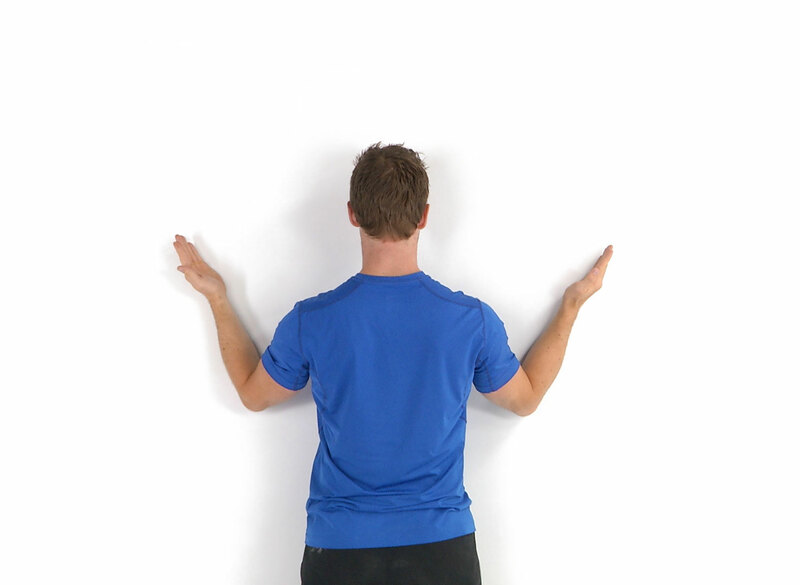 • Stand facing a wall with both hands placed on wall (little finger side). • Slowly lift hands along wall up and to the outside creating a 45 degree angle while pulling your shoulder blades together and downward. • Return to initial position and repeat. • and try to keep your hips/shoulders/ head/elbows on the wall as you slide up and down slowly. • Keep the lower back sligthly arched or flat. • Lie on your back with your knees bent and your back in neutral position (slightly arched). • Place your hands on your lower abdomen and maintain a steady abdominal breathing while you activate your lower abdominals (transversus abdominis) by bringing your belly button inward and by activating your pelvic floor muscles (inner thigh) 20 to 30% of a maximal contraction. • You should feel a slow and deep tension under your fingers without any superficial abdominals activation (rigidity of the rib cage) or any movement of the pelvis. • Begin by wrapping a bath towel around you, with the ends of the towel held in your hands, hovering just over your belly button. Perform a modified crunch by activating your abdominal muscles to lift your head, neck and upper shoulders off the floor. Keep your head aligned with your body as much as possible. • Resist the urge to dip your chin toward your chest. Pull the ends of the towel closer to your belly button as you lift up. 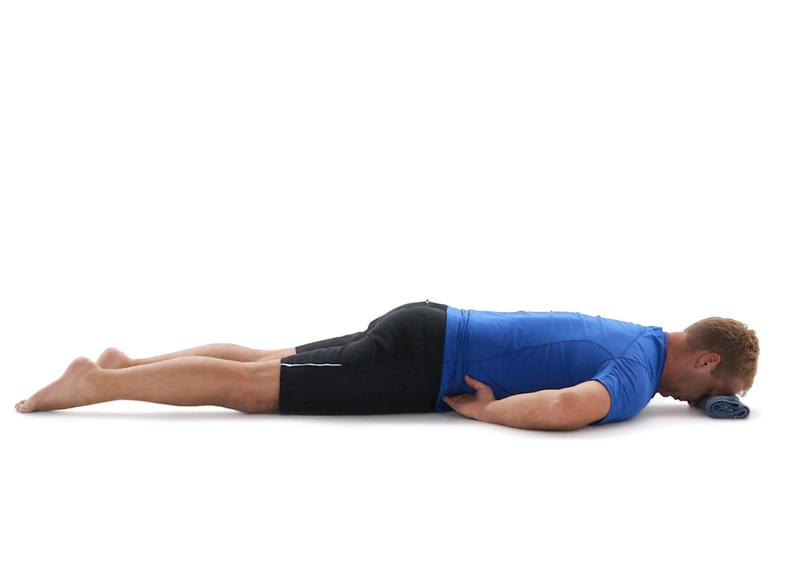 • Lie on your stomach with your back in neutral position. • Activate your lower abdominals (transversus abdomini) by bringing your belly button inward and by activating your pelvic floor muscles (inner thigh) 20 to 30% of a maximal contraction. • Maintain a steady abdominal breathing while you lift one leg up keeping it straight and keeping your back and pelvis completely still. 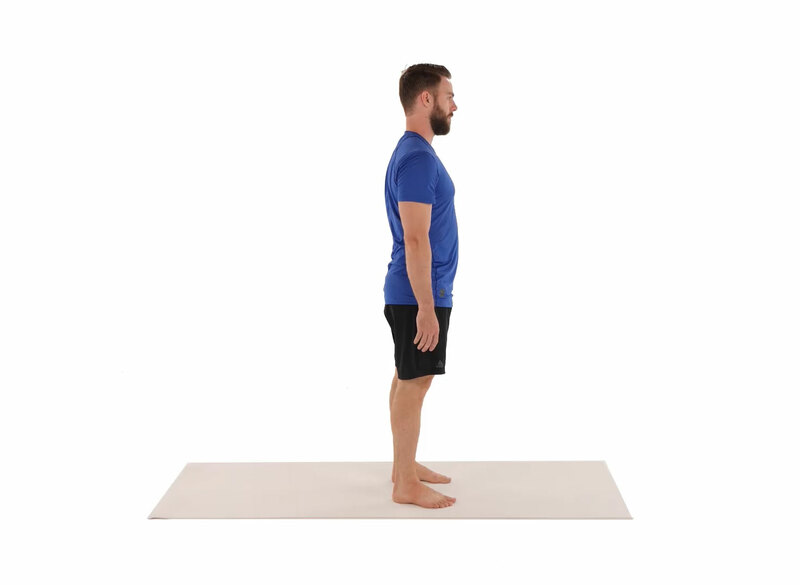 • Return slowly to initial position and repeat beginning with the other leg. • Standing upright on one leg, tip the body forward, hinging at the hips and keeping the back straight. Touch or try to touch the floor and use hamstring to lift you back to the starting position. • Make sure that your knee is aligned with your foot and hips and keep your hips and lower back level as you go down. 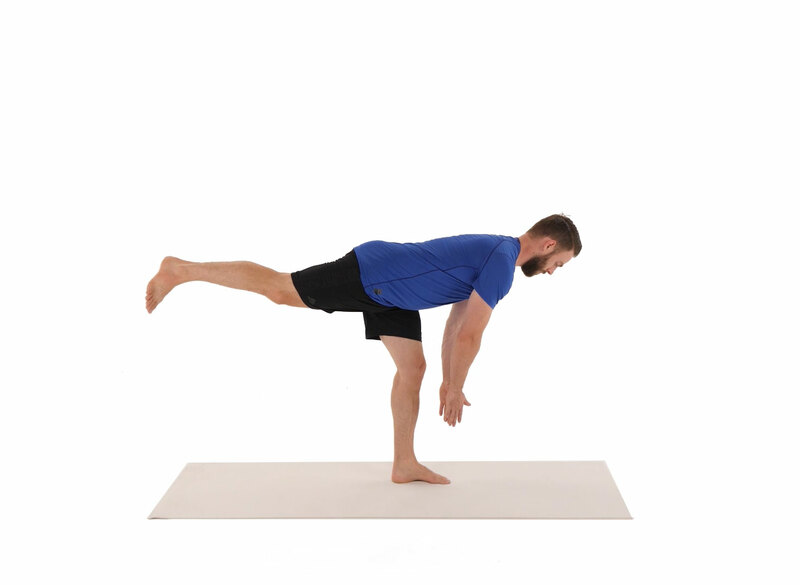 • Standing on one leg and keeping your balance with your arms, swing the leg in a front to back motion. Make sure that the supporting leg and the torso stay stable. • With a hand towel placed on the cervical region, pull in a 45 degree angle toward the front and up while at the same time tucking your chin in and lengthening your spine. • Sit in a chair and grasp the seat with your affected hand to lower your shoulder. • Tilt your head to the opposite side while tucking in your chin and looking at your toes. 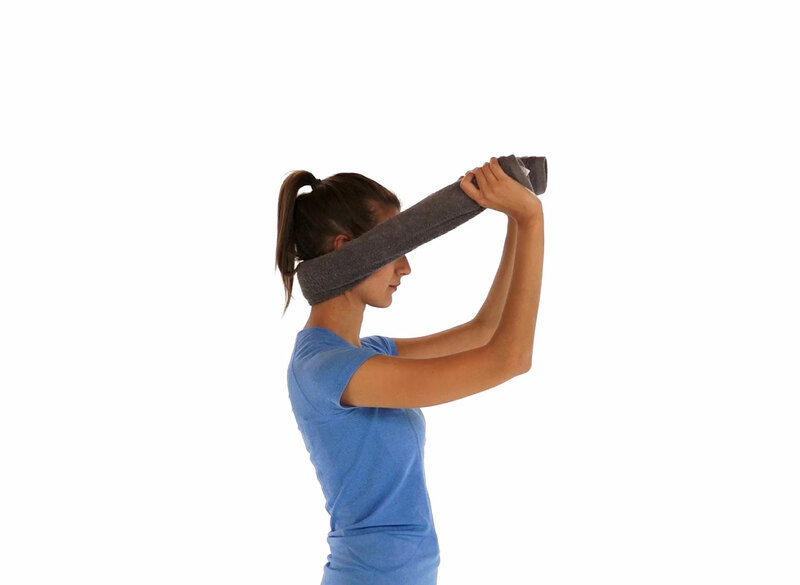 • You may also place your other hand on your head and pull it down until a stretch is felt on top of the shoulder. • Maintain the stretch 20-30 seconds and relax. 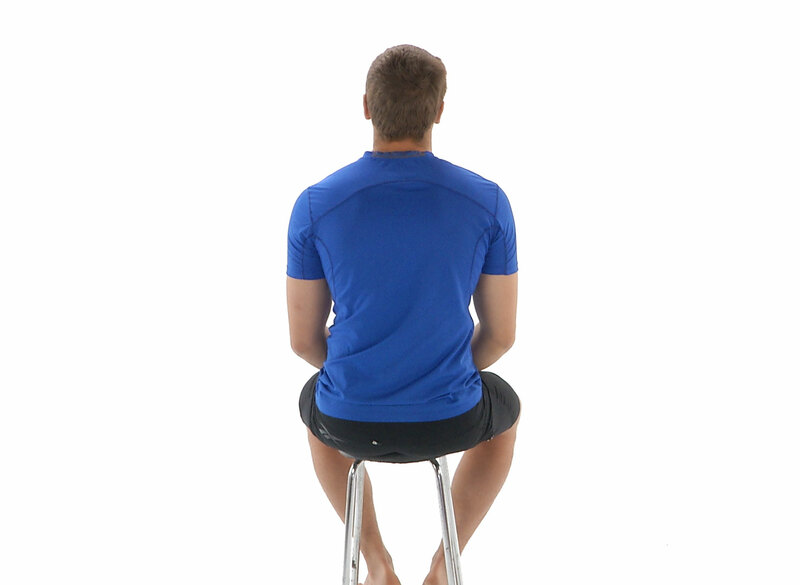 • In a sitting position, it is important to correct your posture and always maintain a neutral spine. • Your lower back must be slightly arched, your chin must be tucked-in and your shoulders must be pulled back. • Image that a string is pulling you up from the back of your head to get you taller. 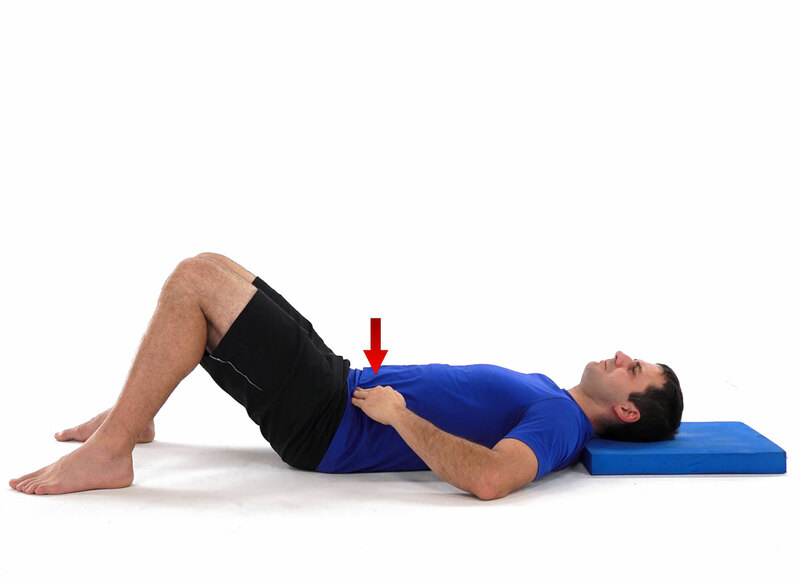 • Once the posture is corrected, activate your lower abdominals (transversus abdomini) by bringing your belly button inward and by activating your pelvic floor muscles (inner thigh) 20 to 30% of a maximal contraction to help you maintain the position for as long as you can. © 2019 - Rheumatology for patients. .